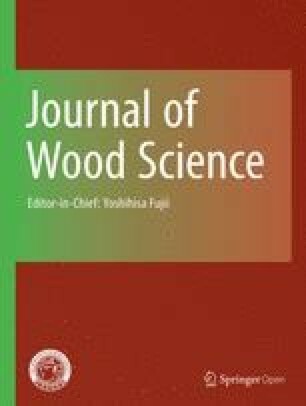 The effect of volatile matter from various wood chips on house dust mites and their influence on human comfort were measured. To investigate the effect of volatile matter on the mite speciesDermatophagoides pteronyssinus, the activity of the mites was observed after exposure to volatile matter from six species of wood chips. The degree of activity of the mites was classified into two categories: (1) walking or moving and (2) immobilized. To measure their influence on human comfort, the smells of those wood chips were evaluated by the subjects. Among softwoods, volatile matter fromChamaecyparis obtusa andThujopsis dolabrata var.hondai chips suppressed the activity of the mites highly and made the subjects feel refreshed and unexcited.Cryptomeria japonica showed slight suppression of the mites and was considered to be refreshing, natural, and unexciting by the subjects. Among hardwoods,Cinnamomum camphora highly suppressed mites activity and was considered to be non-refreshing and exciting by the subjects.